This is the first post of a new series – ‘Workers of the Week’ – that we are going to be running on the blog, designed to highlight some interesting examples of both women’s and men’s work activities that we are finding and recording. There won’t be a post every week, but we’ll aim to produce them on a regular basis, and we’ll be picking examples that date from roughly the same time of year as the post. This way, we hope the series will help us to think about seasonal patterns of early modern work, as well as adding a bit of historical context to the changing of the seasons today. So, our first ‘Worker of the Week’ is a suitably autumnal example: William Thomas (alias Whitegh), a husbandman of Whitechurch, Somerset, who on October 1st 1559, between 9am and 10am in the morning, climbed an oak tree to collect acorns. Unfortunately William faltered and fell to his death – and hence this activity is recorded in the coroners’ reports that we are using as one of the sources of information for the project. It is not entirely clear what he was collecting the acorns for. 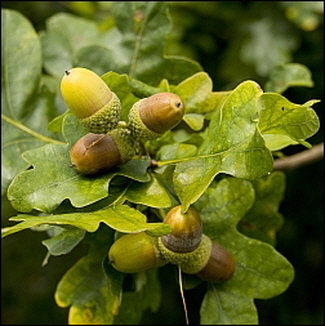 Perhaps to eat, but the acorn of the English oak is very high in tannins and very bitter and astringent, so it seems more likely they would have been intended as food for pigs (although if anyone with a knowledge of recipe books has examples of acorns being used in cooking please comment below). It was and is, of course, an important time of year for gathering up fruits and nuts to bolster winter food supplies, and it’s no surprise that we have found a few examples of people collecting apples at this time of year too, such as Thomas Coburne of Donhead St Mary in Wiltshire, who was collecting apples from a tree growing in his father’s orchard on the last day of September, 1541, when he fell and suffered a fatal wound. Cider making: men’s work or women’s work? So far all the examples of autumnal gathering in our database are undertaken by men, but we are only talking about a very small sample at this stage so it would be unwise to read anything into the gendered division of such tasks just yet. Whilst we are on the subject of apples though, what will be interesting to see will be whether we can find evidence of women’s involvement in what often followed their collection: cider making. We know there was plenty of it going on in the West Country, and tithe cases from the Devon church courts often make reference to the number of ‘pypes of Syder’ an individual had produced in the course of a year. Unfortunately, these cases have so far failed to yield specific enough evidence of who was actually involved in the production process for us to record any instances of cider making in our database. (On our criteria for recording work activities see this previous post. These references to cider production in tithe cases are not references to specific tasks per se, and it is not clear that the farmers listing their quantities of cider made it themselves, or someone else in their household or employ did so, so it’s a good example of the kind of information we are excluding). Hopefully more specific evidence will be forthcoming, as there is an interesting question about the gendered division of labour here. It is widely accepted that the centuries we are focusing on for our project witnessed a process of ‘masculinisation’ within beer brewing, whereby brewing became an increasingly commercialised and lucrative work activity, and so men muscled women out of a type of work that had previously been largely small-scale, domestic, low-status women’s work. But was the same thing happening in regard to cider production? It didn’t undergo the same kind of technological change (i.e. 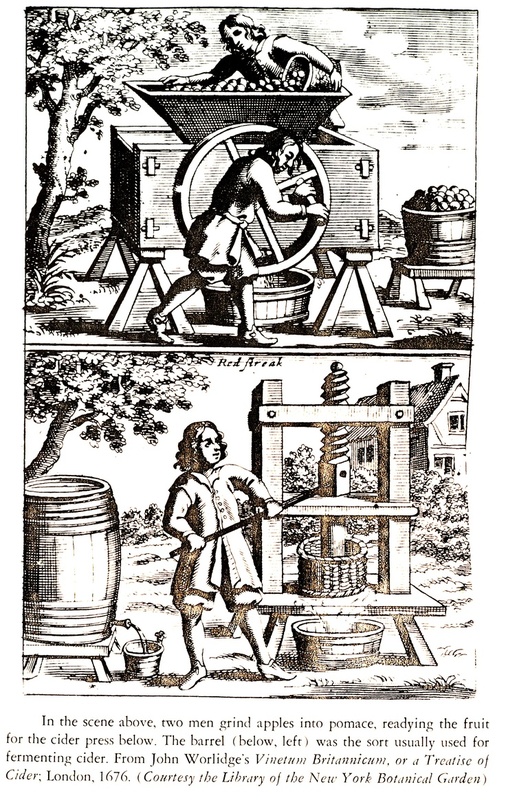 the introduction of hops) and commercialisation that brewing did during this period, so perhaps there was less of a shift in the gendered character of cider making too. But was it traditionally considered women’s work in the same way that brewing had been? If so, did the prevalence of cider in certain parts of the country lead to a different story of the relationship between gender and the production of alcoholic beverages than the narrative of masculinisation we associate with brewing? In a splendid book on early America – Every Home a Distillery – Sarah Hand Meacham argues along such lines: that the ongoing prevalence of hard cider making in the eighteenth-century Chesapeake region, which was very much the preserve of women workers, helped to create a distinctive set of gender relations that marked this region out from its beer drinking neighbours, where men were taking over the brewing process. It’s a hypothesis we might be able to test for England too. Of course, this will depend on us turning up sufficient evidence of individuals actively involved in cider making that has so far been elusive (again, any evidence you have would be very welcome in the comments section). There is one suggestive example though: in January of 1558, one Joane Foxwill, a married woman of Venn Ottery in Devon, was ‘drawing a cup of cider’ in what she described as her own ‘cider house’ outside her back door (when she was set upon and sexually assaulted, the subject of the case). It is not direct evidence that she produced the cider herself, of course, just that she was filling up a cup for someone’s refreshment, possibly her own. But it is tempting to imagine, especially as she describes it as her own cider house, that she was drawing forth a cup of her own handiwork. Hopefully we’ll come across more evidence that will allow us to explore women’s role in cider making more fully as we progress. Thanks to the generosity of Steve Gunn, who has given us access to the data from his Tudor accidents project on these sources, which you can read about here.